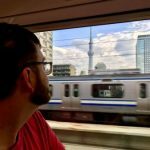 Yesterday the Seattle City Council voted 7-2 to repeal the Employee Hours Tax (aka “head tax”) less than one month after they passed it unanimously. The $275 per full-time employee tax on businesses grossing more than $20 million would have raised about $47 million per year for affordable housing and homelessness services and built an estimated 591 new deeply affordable homes in its first five years. How did formerly unified councilmembers have such a dramatic change of heart? Well, they saw some polls. Admittedly, the few that have been done suggest likely voters are skeptical at this point…five months before the general election. Another reason for the change of heart: the Seattle Metropolitan Chamber of Commerce invested $250,000 in paid signature gathering which propelled their repeal petition past the 20,000 threshold to get on the ballot this November. A head tax referendum being on the ballot would have forced the council to mount a campaign to defend their legislation. Councilmembers Mike O’Brien, Lisa Herbold, and Lorena González–who had previously supported an even bigger head tax–said they did not see a path to victory when faced with early polling data and threatened with the chamber pledging to continuing invest hundreds of thousands to sway the referendum vote–backed by big-spending disgruntled corporations like Amazon, Vulcan, and Starbucks, each of which had already dropped $25,000 shortly after it passed. Only Councilmember Teresa Mosqueda and social stalwart Kshama Sawant stood firm, voting against the repeal. Both delivered impassioned speeches urging bolder action from their colleagues and criticizing Amazon for being duplicitous. Mayor Jenny Durkan had negotiated the head tax down to $275 from $500 and added a sunset clause by saying she had an handshake deal with Amazon, Seattle’s number one employer, to tolerate the tax. Amazon funded the repeal campaign anyway. “A hollow handshake and a broken promise is not good practice,” Councilmember Mosqueda said. Amazon will save $13 million next year (and more each year subsequently) by killing the head tax, which may help fuel CEO Jeff Bezos’ ambition to colonize another planet (since Earth is giving so little resistance). Bezos famously said he’s investing a billion dollars per year in space colonization because he can’t think of much else to do with his $139 billion fortune, the world’s largest–larger than the entire gross national product of Ghana, a country of 30 million people. “The only way that I can see to deploy this much financial resource is by converting my Amazon winnings into space travel. That is basically it,” Bezos said in a Business Insider interview with Mathias Döpfner. 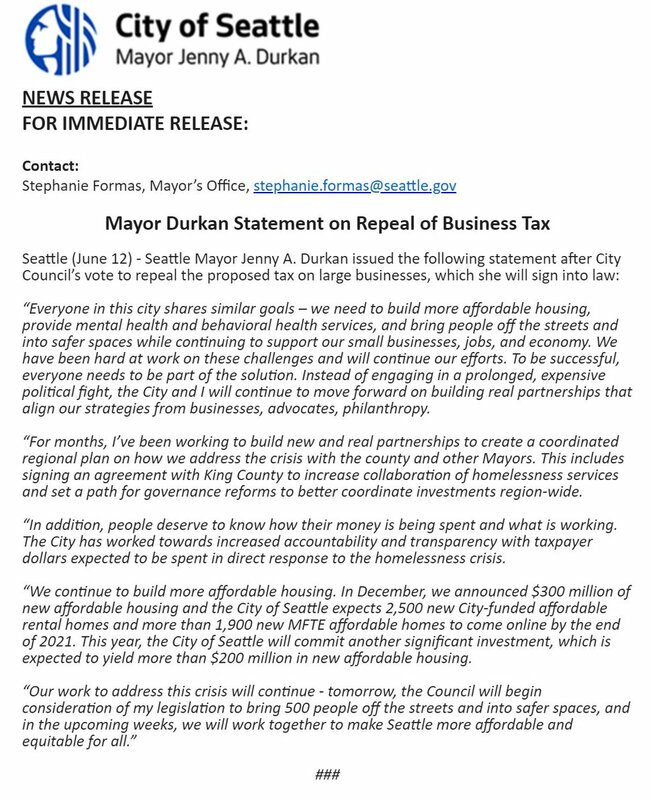 The city council moved quickly to repeal the head tax with the Mayor Durkan’s office emailing a joint statement on the repeal at 12:37pm Monday and the special meeting happening at noon Tuesday. In fact, the turn around was so quick, The Seattle Times’ Lewis Kalb reported the vote may be invalidated because the council violated open meeting rules that require 24 hours notice and open deliberation–this deal seems to have been made in private. Even if the vote is invalidated, it appears the council could just vote again and get it properly done this time. Regardless, it’s all a terrible mess. Nobody yet knows what a replacement strategy would look like. Councilmember O’Brien vowed to work hard on a replacement and Councilmember Herbold spun this vote as just the beginning, but both admitted they had nothing at this point. Meanwhile, 6,320 King County residents were unsheltered at last count. To be fair, the seven councilmembers that backed down were under significant pressure, even from their own party. Democratic state legislators came out against the head tax arguing it’d make their reelection campaigns harder. Democratic state senators Mark Mullet (Issaquah) and Guy Palumbo (Maltby) even threatened to back a Republican bill to repeal the head tax at the state level. Democratic Party heavy hitters like King County Executive Dow Constantine came out against the head tax, but he also hasn’t come forward with a funding solution. Governor Jay Inslee wasn’t rushing to its defense, but boasted of how big the Boeing tax loophole was in arguing the head tax would not cost aerospace jobs. So, I guess that’s positive, but also this constant race to the bottom is probably part of why progressive taxation is so hard for this state and country. Executive Constantine had floated a King County sales tax measure last year along with former Mayor Ed Murray but let that plan drown after Murray resigned. Several councilmembers and testifying advocates argued against using a sales tax bump since it’s yet another regressive source of revenue that hits the poor hardest in a state with the most regressive tax code in the nation. Another high-ranking Democrat, party chair Tina Podlodowski, stopped short of saying the head tax was a bad idea, but called it a cry for help and proposed bringing business to the table in an Overcast podcast interview. Podlodowski gave a nod to rezoning in her comments, echoing Seattle Metro Chamber president Marilyn Strickland’s rebuke after the head tax passed. Rezones are red meat for urbanists, but the timing is suspicious. It will really be impressive when powerful political players go to bat for rezones without simultaneously trying to kill a progressive tax. Rezones are great but without more money for affordable housing we cannot tackle the housing crisis. A better plan is to do both; wealthy inequality doesn’t immediately go away because of a rezone, and, without a strategy in place, it might exacerbate it. Executive Constantine and Mayor Durkan announced their intention for a stronger regional partnership in early May, although even a sketch of a regional funding plan still hasn’t materialized. Some commentators have suggested Mayor Jenny Durkan either never intended her compromise to survive or got played by Amazon. Erica Barnett argued it was a poor strategy to primarily negotiate with Amazon when hundreds of businesses were affected. Whatever it was, it didn’t work out well for Seattle’s homeless. Will business come to table in good faith? Will the business-placating politicians come up with “innovative” ideas that somehow spare them from tough political lifts? Can an affordable housing solution be crafted, as Mayor Durkan suggested, without “engaging in a prolonged, expensive political fight” and with the blessing of business? We shall see.